I know, I know. You still feel like it doesn't offer quite as much glitz and glam as its more publicized (and, frankly, more boring) peer airing in March. But good news: The SAGs has something to offer you too. More specifically, inside knowledge that will do you well come Academy Award bracket time. 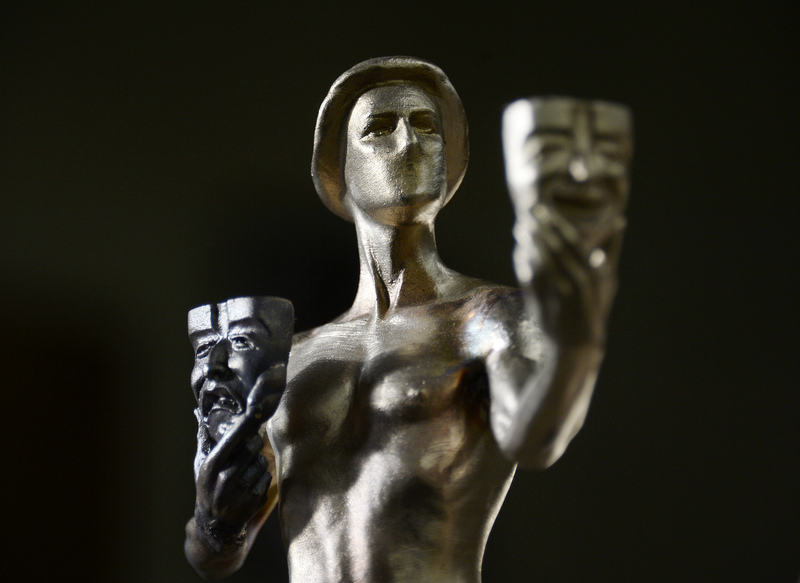 As far as SAG Award predictions go: In 2013, the SAG Awards went 14 out of 20 matches with the nominees for the Academy Award. SAG correctly predicted the big Oscar wins for Best Motion Picture (Argo), Best Actor (Daniel Day-Lewis in Lincoln), Best Actress (Jennifer Lawrence in Silver Linings Playbook), and Best Supporting Actress (Anne Hathaway in Les Misérables). The SAGs, though perhaps not as lauded as the Oscars, do give credit where credit is due to the lesser-knowns. In the Best Supporting Actor category this year, they forewent the obvious choice of Jonah Hill for Wolf of Wall Street (I am not sad about this), and instead included the late, beyond great James Gandolfini for his performance in Enough Said. It would be lovely to see him honored posthumously for his role opposite Julia Louis-Dreyfus (and really, all the great work he did in his lifetime). Also, The Screen Actors Guild was wise enough to nominate Forest Whitaker and Oprah Winfrey for their performances in Lee Daniels' The Butler, which I am side-eyeing the Academy for skipping. And if Kerry Washington best get recognized by her peers in Hollywood for her outstanding work and outstanding group ensembles on Scandal, would you really want to miss that? The list of presenters is damn impressive and glitzy. The Oscars couldn't bother to ensure she'd show up, but the SAGs got OPRAH TO PRESENT. Also on the roster: Ben Affleck and wife Jennifer Garner, Kerry Washington, Tom Hanks, Clark Gregg, Kevin Spacey, Don Cheadle... the list goes on. The fact that, this year, the SAG Lifetime Achievement Award goes to the beautiful and legendary Rita Moreno, the only Hispanic woman who has ever EGOT'ed? Feels like a cheeky response to the Golden Globes honoring Woody Allen for his life's work. But, really, why are the Screen Actors Guild Awards worth your Saturday night? Because, really, even if they're half as prestigious as the Oscars, they're twice as fun. Find yourself going for a bathroom break every year as the Academy Awards deliver editing awards? Sit down and get comfortable during the SAGs, an awards show that solely honors the stars you tune in to see in the first place. Plus, really, it's just another opportunity for a Jennifer Lawrence podium GIF, and could you really pass up on that? So watch it. (Here's how.) Don't listen to Tommy Lee Jones.